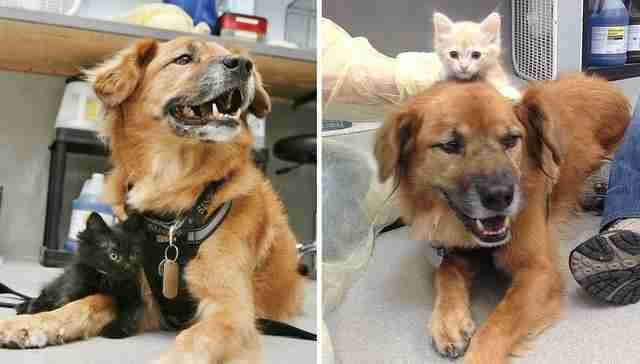 Ten years after surviving the devastating onslaught of Hurricane Katrina, Boots the dog is alive and well and still helping out hopeful kittens at the Arizona Humane Society (AHS). 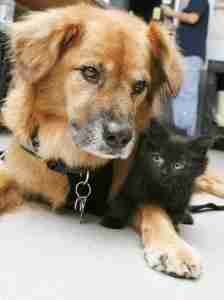 Boots, a chow/shepherd mix who was rescued by AHS emergency animal medical technicians a decade ago, has been hard at work paying it forward for dozens of kittens through AHS's kitten nursery. 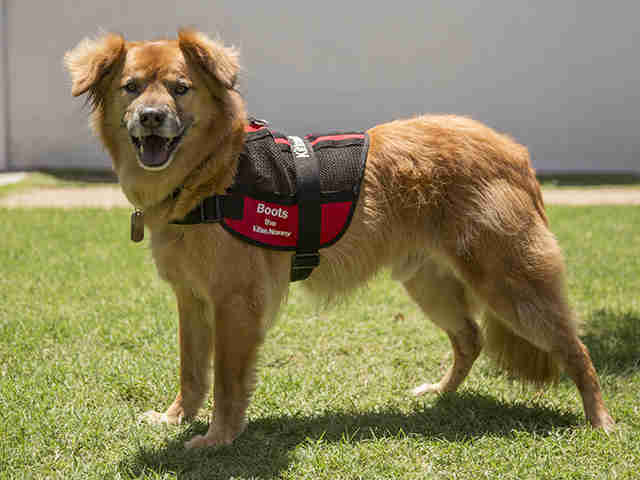 The vivacious little pup was one of nearly 300 animals retrieved in New Orleans and brought back to Arizona for treatment. 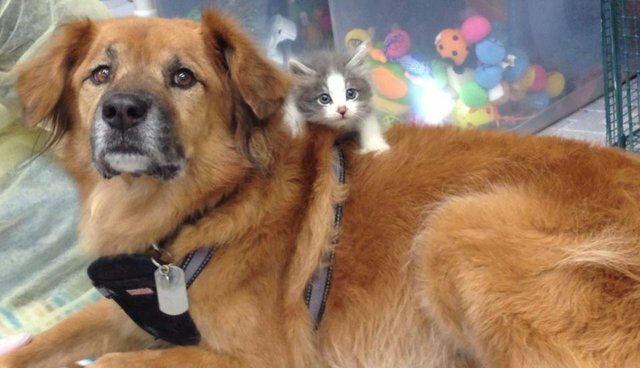 After making a full recovery, he was adopted by one of the volunteers who helped rescue him. We previously reported on Boots's escapades in comforting these little guys and helping them acclimate to their new surroundings while also providing them with an important outlet for socialization. The Dodo is happy to say that on the eve of his anniversary of survival, he's still hard at work being a buddy for his feline friends. "Boots is amazing!" AHS's public relations manager Bretta Nelson told The Dodo. 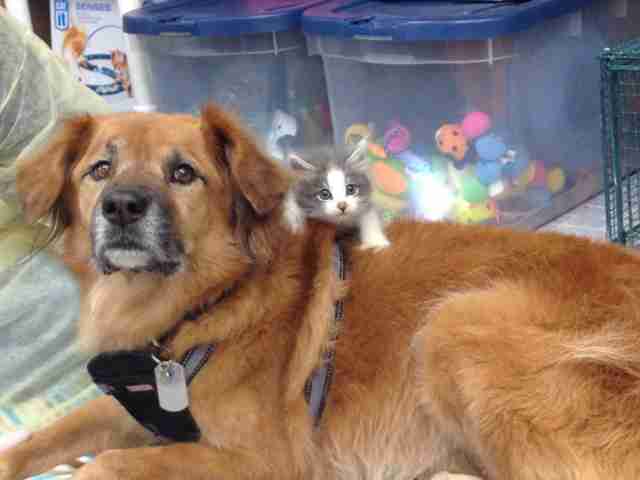 "He puts on his kitten nanny vest and comes every Wednesday to volunteer in the Arizona Humane Society's kitten nursery." The kitten nursery was created to fill a critical need in the social development of the kittens who come into the care of the shelter. Studies have shown that there's a brief period in the early weeks of a kitten's life where social interactions can determine how he'll act toward others the rest of his days. AHS's feline welfare specialist, Liz Truitt, came up with the idea of involving a dog nanny in the process. Boots was chosen for his friendly disposition, calm demeanor and all around happy-go-lucky-attitude and ability to let the kittens crawl all over him without complaint. During the last season, the nursery helped to provide medical care and homes for over 500 kittens and Boots got to help watch over many of them. Nelson says that in addition to his duties as a nanny, Boots acts as an ambassador at school visits, speaking engagements and other events. It looks like Boots is ready to pay it forward for years to come! If you're interested in helping out the many kittens in need at AHS's kitten nursery, you can find more information on their website.